Update 9/2010: Many thanks to everyone for their support. I regret to inform you all that Logger will no longer be maintained. What can I say? I no longer have the free time to give it the attention it deserves, technologies have changed and there is no longer really a need for the tool now that the OS has evolved. I will keep this site up for the time being though, just in case anyone is interested. 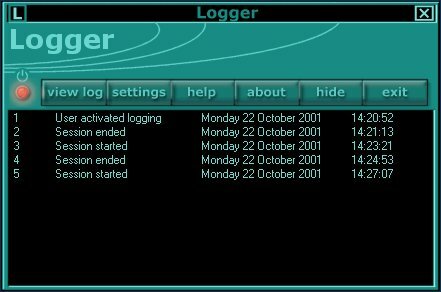 Logger is a Windows program that keeps a log of the most recent system startup and shutdown times. Logger takes down these times automatically. What can I use Logger for? - or to check how long your kids have been sitting in front of your PC. Logger 2.0 has appeared in PC-WELT magazine issue 3/2002 as one of the "25 top freeware tools" and was included on the CD coming with the magazine. PC-WELT is the German edition of PC World USA, according to IVW Q 3/2001 audition it is the best selling monthly PC-magazine in Europe. You can find more detailed information in the ReadMe file that comes with Logger. Logger runs under Windows 95 or higher, is easy to use and has a comprehensive help system. Logger is freeware, which means that you don't have to pay for it and can pass on copies. It can currently record up to 250 log entries on a most-recent-basis.